Neither of us had a good night's sleep for some reason, and the alarm went off earlier than we would have liked. We needed to be up and scrubbed as today we were setting out for Avila, Northwest of Madrid, a journey of about sixty or seventy miles. We wanted to take a look at the city wall, and it tied in nicely with a visit to Segovia. We made the vehicle ready for the journey, then drove down to the dump station. As usual there were people ahead of us who seemed to be in no hurry whatsoever - and they weren't even Spanish. Having punched the co-ordinates in to the satnav we had to wait and see which way 'She' wanted to take us today. Some days 'She's' spot on and others 'She's' fit only for the rubbish bin. There were two possible options to get to Avila. One was the long way round using motorways adding fifty miles to the journey. The second was across country, far more direct. 'She' went for option one, but we disobeyed 'her' and went for option two, and I'm so glad we did. Granted it was through the mountains, but the road, although single lane, was good, and the views absolutely lovely. There were times later in the cross-country trip that you'd have thought you were in the Lake District (thanks to a large dam), and others, the Yorkshire Dales. At the end of the journey it started to rain lightly, making it more like a summers day on Great Yarmouth sea front. We were lucky enough to stumble across a supermarket on the edge of town and were able to top up with fresh provisions plus the important stuff like beer and wine. Again we had two options when we arrived here, a local campsite, catching the bus in to town, or the free car park just a stone's throw from the city walls. 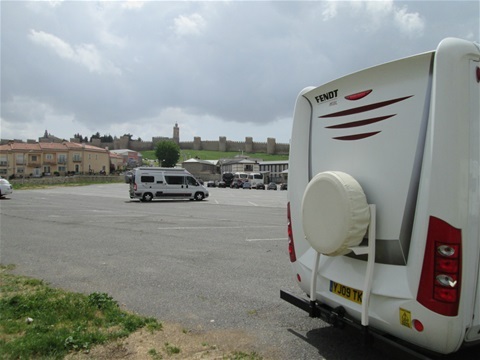 For me it had to be the free car park since The Chef earned not one cent out on the streets trying to recoup our costs at the last campsite (£25 a night for a parking place, a bit of electricity, a hot shower and all the dog barking your nerves can stand). Once we were settled, we set about doing the housework. For too long it had been neglected. I don't think we'd had a good clean through since Gibraltar, which is far too long, but we resisted because the pitch surfaces were grit and dust, which, when it got a bit breezy made housework seem a bit pointless. So there we were, with dark cloudy skies and thunder in the distance, heaving out the carpets and their protective coverings, hoovering and washing the floor throughout, spray polishing all surfaces and a good clean of the loo. I have to say it looked a lot better for the effort we'd made. After lunch we went for a wander around Avila. Avila, at 3,710ft above sea level is the highest provincial capital in Spain. In winter, access roads can be blocked by snow. The centre of the city is encircled by the finest-preserved medieval walls in Europe. Built in the 11th century, the walls are over one mile long. They are punctuated by 88 sturdy turrets, on which storks can be seen nesting in season. The weather had changed today, not that we can grumble of course. Back home folk are suffering low temperatures with sleet and snow. Here we are having to endure only cooler temperatures, cloud, thunder and light rain showers, and this rain is the first we've seen since we were at Benicassim a few weeks ago. We wandered around the town, which is very pleasant, playing the tourist. We discovered that they allow visitors to walk along the city walls for free on Tuesdays between 10:00-16:00, it was Tuesday, it was 15:30, yet they told us we'd have to pay. Spanish logic for you. Never mind, perhaps we'll do it tomorrow. We have a whole day here tomorrow, and intend to spend the evening in town as well. I think it gets floodlit when it's dark with a real café culture there. The reason we didn't go down this evening is that firstly we feel quite tired, and secondly I'm guessing that not even the Spanish are stupid enough to sit outside and have a meal with a cool wind blowing with the chance of rain...................but then again.